Unemployed Cover Letter example can be used for your job applications. Amend it as suitable and use it for free. Covering letter for a unemployed job seeker. Be the first applicant to be called for an interview with your CV accompanied by the best cover letters you can ever write. Writing an effective and powerful cover letter can be tedious and boring at times. However, practice can make you a perfect candidate for the job you are applying for. Take serious efforts in learning how to write a good letter and CV for your own sake. There are best cover letters that you can see but personalising them and making them your ticket for the job interviews takes a lot of efforts and serious study. For one,a good resume cannot stand alone;hence,it needs the help of a good cover letter to hold the interest of the reader. He/she may or may not check further the details you have provided in the CV. The best cover letters can stand alone because they already summarise your CV. Simply put,the letter must have the right format and well organised thoughts. The highlights you have written in the letter reveal your personality and must therefore speak of your qualities as required of the job. Most employers do not have the luxury of time to read long letters and CVs. If you are able to capsulise your skills, experience and abilities relevant to the position you are applying for, chances that you have held the interest of your reader are high. To write best cover letters – refer to the qualities and job requirements that the company is looking for from the candidate. You can briefly indicate your qualifications in each specific requirement. The resume’s goal is to back up your cover letter. There are several approaches in writing letters but you have to take into account the qualities that make up the best cover letters. Your letter must be able to convince the employer that you are the fittest person for the job by being relevant to the position. It should be able to explain briefly your skills and experiences/training to match the job requirement. Employers are only interested in applicants who meet the requirements and who can be an asset to the company because they know what they can get from you and not what you get from them. 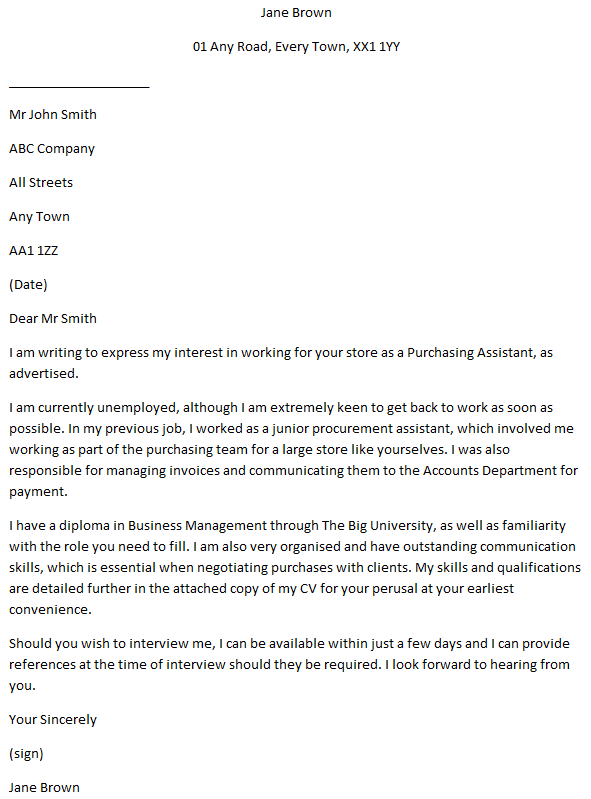 I am writing to express my interest in working for your store as a Purchasing Assistant, as advertised. I am currently unemployed, although I am extremely keen to get back to work as soon as possible. In my previous job, I worked as a junior procurement assistant, which involved me working as part of the purchasing team for a large store like yourselves. I was also responsible for managing invoices and communicating them to the Accounts Department for payment. I have a diploma in Business Management through The Big University, as well as familiarity with the role you need to fill. I am also very organised and have outstanding communication skills, which is essential when negotiating purchases with clients. My skills and qualifications are detailed further in the attached copy of my CV for your perusal at your earliest convenience. Should you wish to interview me, I can be available within just a few days and I can provide references at the time of interview should they be required. I look forward to hearing from you. Make sure you don’t sound like you’re unemployed because you’re unemployable or lazy. Two types of people look for jobs: those who are unemployed and those who are looking to change from one job to another. You could explain why you’re unemployed. If you’ve left a job, don’t make it sound like it was because you can’t stick at anything. If you were sacked, you don’t stand a very good chance of being favoured, unfortunately, but just don’t make yourself sound like a terrible person to employ.